Why should I share SPEAKJAPAN.org? How do I use SPEAKJAPAN.org? 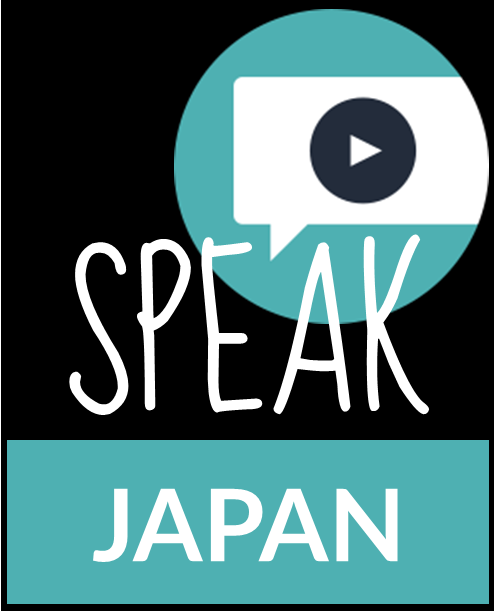 SPEAKJAPAN.org is a website which promotes the study of the Japanese language. It's filled with information about the strong connection between Japan and the US, the worldwide popularity of Japanese culture, Japanese contributions to the world, and the strength of Japan's economy. 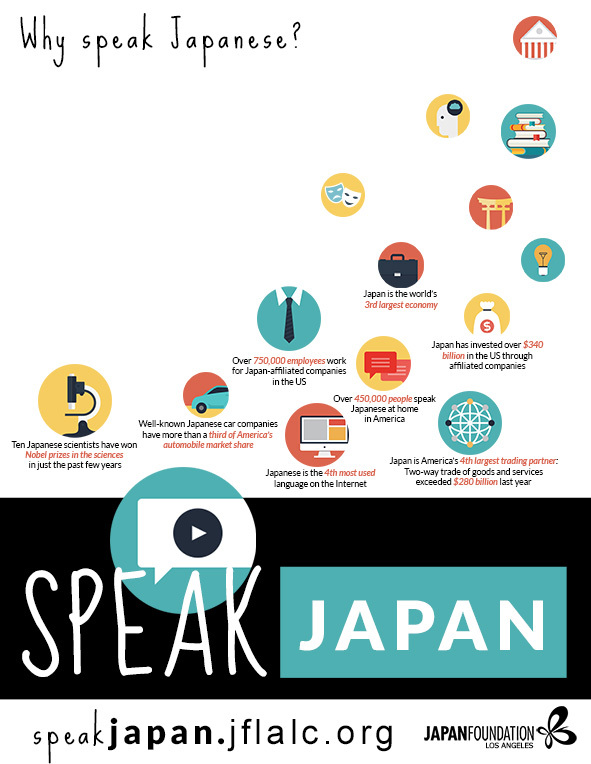 It is our hope that these wonderful facts about Japan will inspire people to study Japanese. When someone asks you, "Why should I study Japanese?" don't you wish you had a handy list of reasons with up-to-date and well-cited statistics? Sharing SPEAKJAPAN.org can help with student enrollment, showing parents that studying Japanese has benefits beyond exposure to Japanese popular culture, and showing administrators that studying Japanese opens doors for students. To save, right click and click "save image as"
Don't forget to hyperlink the image with the SPEAKJAPAN.org URL (http://www.speakjapan.org). You can usually do that by right-clicking on the image/text and choosing "hyperlink" in the menu, or by clicking on the link button in your editor. Make contact with the student guidance counselors at feeder schools (schools whose students may end up attending your school), and share SPEAKJAPAN.org with them. They might appreciate having resources that they can share with students who are curious about languages. Approach the other language teachers at your school and suggest starting an International Culture Day, so that every language teacher can have a chance to advocate for their language at the same time. Students can see for themselves how much fun learning Japanese can be, and you can have a stack of SPEAKJAPAN.org brochures available for them to look at. 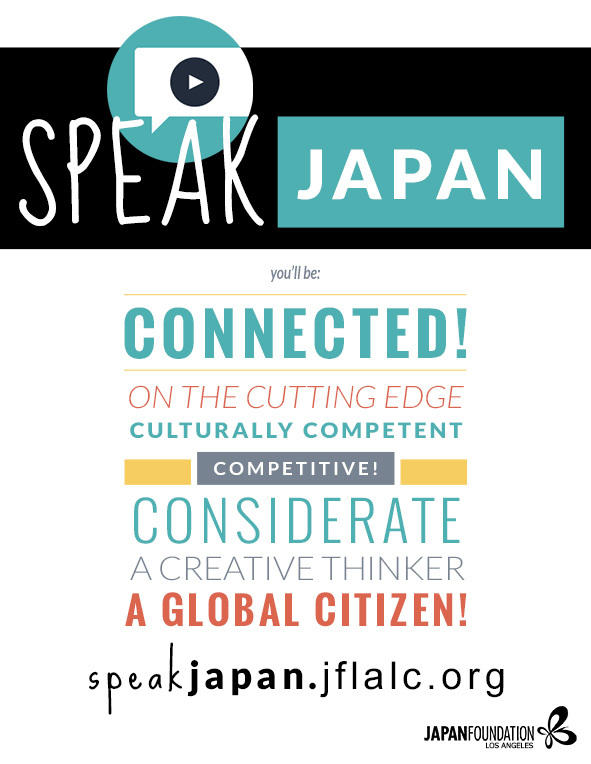 If you have any other suggestions for using SPEAKJAPAN.org, please email jflaeducation@jflalc.org and they may be posted here. 1) Print out all four PDFs. 2) You will need to cut off some of the white paper edges. 3) Tape the four pieces together so that the pieces line up perfectly. 4) Reinforce the back as well. 5) Post the poster on your wall!